High school students from across Dearborn collaborate to design and make public art through the Pockets of Perception-We Are One Community (POP) project. POP is an initiative of the nonprofit DCF as it supports programs that enrich the Dearborn community. POP is an acronym for Pockets of Perception – We Are One Community, focusing on young people, encouraging multicultural understanding, while cultivating their creativity and investment in the community through the creation of public art. Through the apprentice-style program, the group of ten 11th grade students on POP Team 3 worked together every Saturday in the 2015-16 school year to work with teachers, artists and professionals to design and build a sculpture for permanent display in the Dearborn City Hall Artspace Lofts. Their sculpture, made from original doors from Dearborn’s historic City Hall building, was “unveiled” during a public open house in October 2016. The students on POP Team 3 (shown above): Conaire Donelson, Tyler Platz, and Emma Clare Scott from Dearborn High School; Corey McDonald, Edsel Ford High School; Fatma Almachy, Khalood Altahesh, Zeinab Elmoussaoui and Nour Jamalaldin from Fordson High School; and Steven E. Gonzalez, Jad Hamdan and Lakiya Pickens from the Henry Ford Academy. Dearborn art teacher Mohamad Bazzi and Wendy Sample, a former Art Resource teacher for the Dearborn Public Schools, provide professional guidance for the team. The inaugural POP team in 2010 designed two complementary stainless steel sculptures that are now displayed at Dearborn City Hall Park and the West Dearborn Pocket Park. POP Team 2 made ceramic tiles and designed a mosaic mural that was unveiled last spring in the new John D. Dingell Transit Center in Dearborn. Students must complete their year-long commitment to participate on the team in order to receive a stipend when their project is finished. The POP Project is supported in part by a grant from the Michigan Council for Arts and Cultural Affairs and the National Endowment for the Arts Art Works. Other major donors are the East and West Dearborn Downtown Development Authorities, the Ford Motor Company Fund and the Kosch Family Foundation. “All of our sponsors recognize that art brings communities together and they want to offer students the opportunity to develop their talents while learning how to work in a team environment outside of school walls,” Woodyard said. Funded completely by donations, POP is a project of the Dearborn Community Fund, a 501c3 nonprofit organization with the mission to support programs that contribute to the vibrancy of the Dearborn community. To donate or for more information, www.dearborncommunityfund.org or call 313-943-5478. The POP program was introduced in 2010. POP Team 3 completed a sculpture in 2016 that repurposed doors from Dearborn’s historic City Hall for installation in the City Hall Artspace Lofts. At the conclusion of the project, each team member received a stipend up to $1,000 along with great experience to list on college or job applications. In November 2014, POP Team 2 unveiled their work: an impressive 20-foot-tall mosaic entitled “Transitions” that is the permanent focal piece of the new John D. Dingell Transit Center in Dearborn. POP Team 1 designed two complimentary public sculptures that have been on permanent on display since 2012. The sculpture “We Are One Community – Arch” is located in City Hall Park at the southwest corner of Michigan Ave. and Schaefer. Its companion piece, “We Are One Community – Bench” is located in the West Dearborn Pocket Park on Michigan Ave. between Mason and Monroe. POP is funded completely by donations. Individuals and companies interested in making a tax-deductible donation to support the program should contact DCF at 313-943-5478 or click here to donate online. 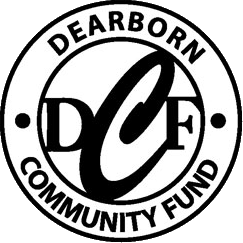 POP is one of the cornerstone programs of the Dearborn Community Fund, a nonprofit organization committed to providing enrichment opportunities and support of projects that enhance the quality of life in the city of Dearborn. To see more photos of POP team students and their work, see photo albums in the Dearborn Community Fund’s Facebook page. Donors who have supported the POP program since its inception in 2010 include The Ford Motor Company Fund, both the East and West Dearborn Downtown Development Authorities, the Exchange Club of Dearborn, the Kosch Family Foundation and numerous other individuals. Ten students from Edsel Ford (EFHS), Fordson (FHS) and Dearborn High School (DHS) worked with the Dearborn Community Fund on the 2012-14 POP team 2. The students designed a mosaic that was installed in Dearborn’s new John D. Dingell Transit Center. Photos below show the students with their completed mural during the Transit Center’s Grand Opening in December 2014. See more photos in “Albums” on the Dearborn Community Fund Facebook page. Photo above: POP Team 2 members at the dedication of their mosaic, which they titled “Transitions,” from left: Instructor Wendy Sample, Claire Young (EFHS), Reem Aoun (FHS), Siham Saleh (FHS), Mona Beydoun, Instructor Mohamad Bazzi, Frankie Nunez (DHS), Leah Wendzinski (DHS), Jack Davis (DHS), Aleen Bazzi (FHS) and Khalid McDowell (EFHS). Not pictured: Mary Charara (DHS). Photos below show the completed mosaic, with the students titled “Transitions,” at the grand opening of the John D. Dingell Transit Center in Dearborn. 1. Congresswoman Debbie Dingell is in the first photo with student Frankie Nunez from POP Team 2 who worked on the mosaic installed in the John D. Dingell Transit Center. 2. Dearborn John B. O’Reilly, Jr. explains the important role of the POP Team as the students learn to work together with their instructors and professions, such as the Transit Center’s architect, to make art for Dearborn residents and visitors to enjoy. 3. Additional photos show the final mosaic, students working on the mosaic design and making tiles.